With so many wonderful amenities available at Tidewater Beach Resort you won�t know what to do first! Start your day gazing at the stunning views from your private balcony with a cup of coffee from the Rocky Shore Coffee Company, located on-site, before heading out for the day. Enjoy a great workout in the state of the art fitness center and a steam in the sauna. Now, throw on your bathing suit and enjoy a day of fun in the sun by either of the two 4,300 square foot lagoon pools. Tidewater rests on 600 feet of prime sugar white sand to play on and emerald green waters to play in. Beach services are available for a fee paid to the resort. Enjoy lunch at Liza's Munchies located just above the front desk (they also provide room service!) In the evenings, cookout on the available grills, soak in a sunset at the hot tub and enjoy a movie with the family in the media room. 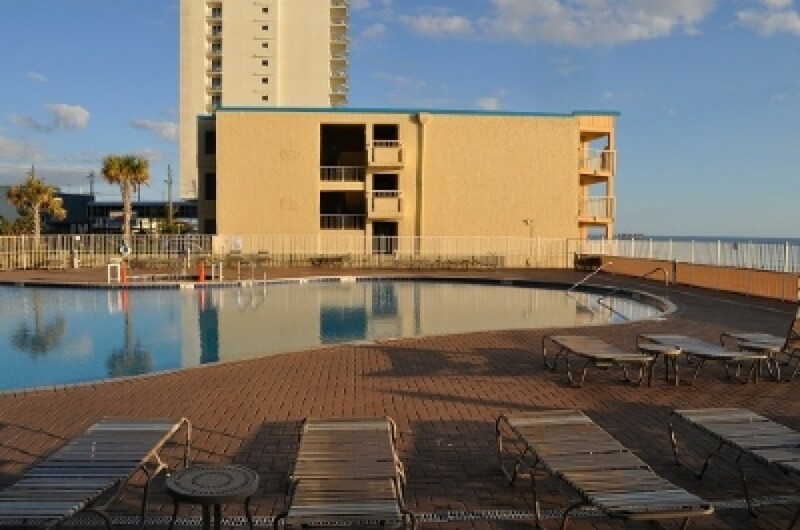 Tidewater is only a half mile and within walking distance from the fabulous Pier Park shopping and entertainment center which boasts a mix of dining, retail and entertainment opportunities.You'll find the Frank Brown Recreational Park just minutes away. Features of this upscale condo include an upgraded kitchen with granite counter tops and every modern convenience that you'll need during your stay. The master bedroom includes a king bed and private in suite bath with tub/shower combination. You'll find twin bunks in the alcove in the hall and the family room offers a queen sofa sleeper so that this condo will comfortably sleep 6. The second full bath offers a stand up shower. The living area and bedroom both have a flat screen TV. The expansive balcony affords the most incredible views from sunrise to sunset.